The Hawthorne Ordnance Museum is chockfull of military hardware, which I confess to knowing very little about. I can only wander around and stare. I confess, however, that I thought these instructions were something I could follow in an emergency, like when a tank was crawling up our driveway. You want the smaller end in front. Cover your ears. Small towns come in a variety of flavors– each one unique. And it is my experience that the small towns of Nevada are more unique than most. Maybe it comes from their boom and bust history as old mining towns. Derelict mines and falling down shacks dot the landscape. Certainly their existence on the remote edge of nowhere has an impact, as does their extreme desert climate. Whorehouses perched on the outskirts of many towns provide a unique, Old West twist. Prostitution is still legal. The state is a do your own thing kind of place. And finally, there is the omnipresent military. Nevada is America’s go to place for testing the latest, most secret military hardware, for training troops, and for practice at blowing things up. Thousands of square miles are devoted to these pursuits. As a child growing up in the foothills of the Sierra Nevada Mountains, I remember getting up at 5 AM to watch the eastern sky lit up by an atomic blast 50 or so miles north of Las Vegas. It was apocalypse now but we were taught that our ability to destroy the world assured a safe future. No wonder the youth of the 60s and 70s turned to drugs. 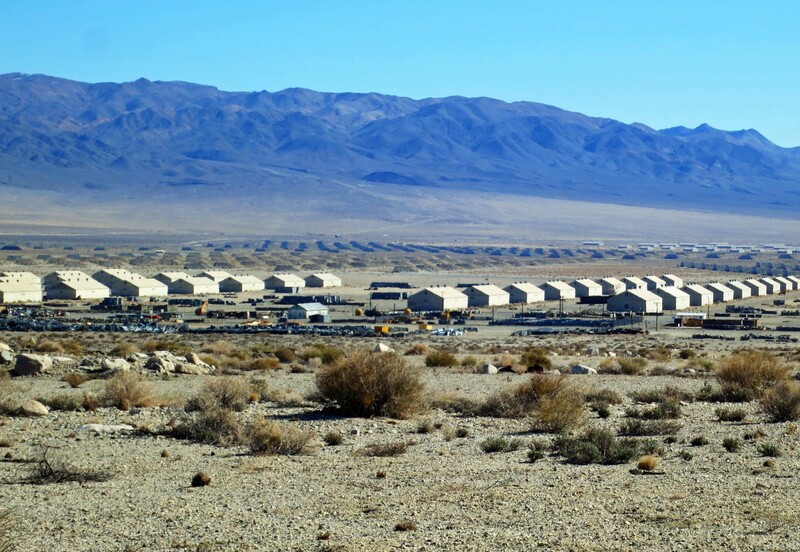 Hawthorne, Nevada has a slightly different connection to the military. It’s where old military ordnance goes to die. Some thirty-three hundred cement bunkers spread out from the town across the desert over 147,000 acres. 400 miles of underground railroads connect the various bunkers. If all the munitions decided to blow at once, it would make a very big BOOM. That’s what happened in 1926 when the Navy’s principal ammunitions depot located in Lake Denmark, New Jersey blew up, wiping out the town and killing 50 people. It was decided that a more remote location was needed for storing munitions. Hawthorne fit the description. The site was officially adopted in 1930. By the 1940s Hawthorne had become known as the “World’s Largest Ammunition Depot,” providing munitions for most of the Allies’ Pacific operations during World War II. In addition to being remote, the site had the advantage of being out of reach to Japanese bombers. This gives an idea of what the bunkers look like and the remote nature of Hawthorne. Note the bunkers behind the buildings looking like burial mounds and stretching off into the distance. During World War II, most of the munitions used by Allied Forces in the Pacific were stored at Hawthorne. This is an original paper displayed in the museum. 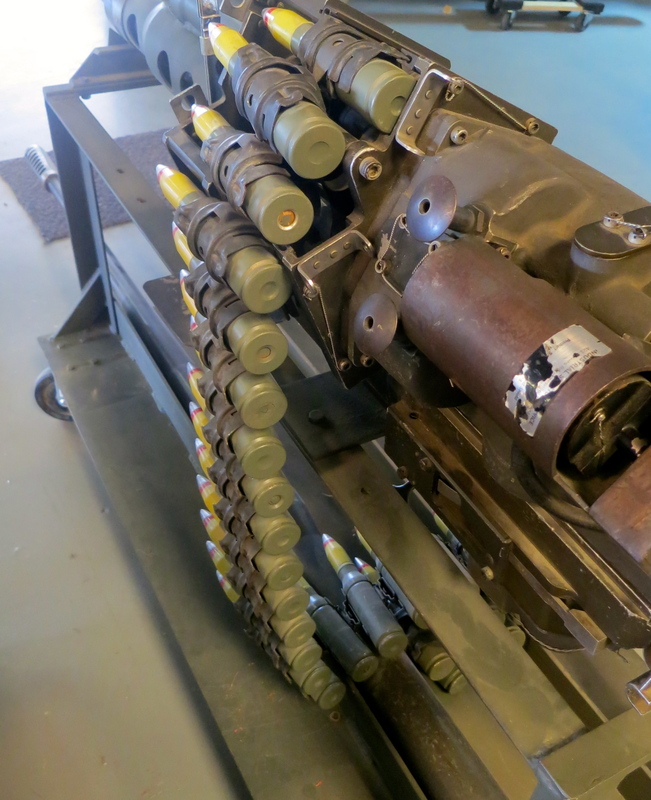 Today the depot boasts the latest technology for disposing of “unserviceable munitions,” which is carried out by a private firm, the Day Zimmerman Hawthorn Corporation. Have you noticed how more and more of America’s military chores are being carried out by private firms? As an aside, way back in the early 1900s, Day Zimmerman invented the machines that put foil on Hershey Chocolate Kisses. 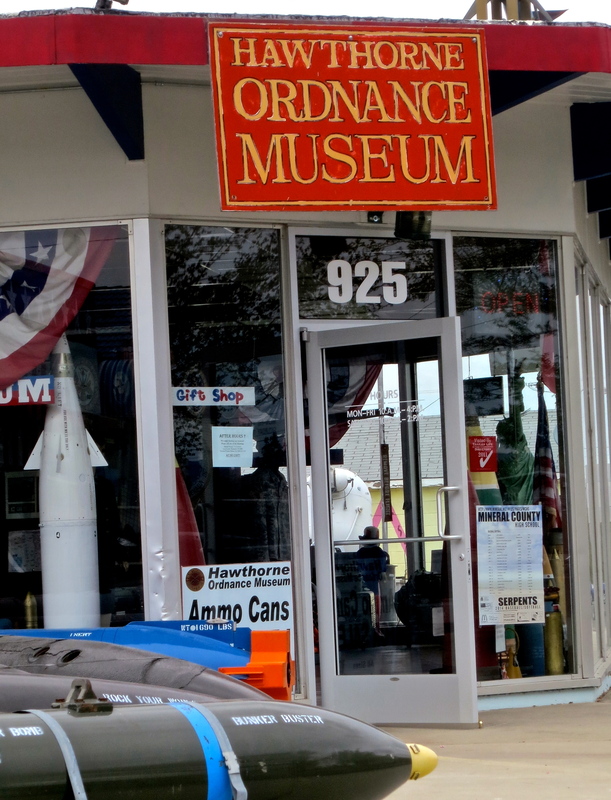 The Hawthorne Ordnance Museum is a must see place if you ever find yourself zipping between Reno and Las Vegas on Highway 95. 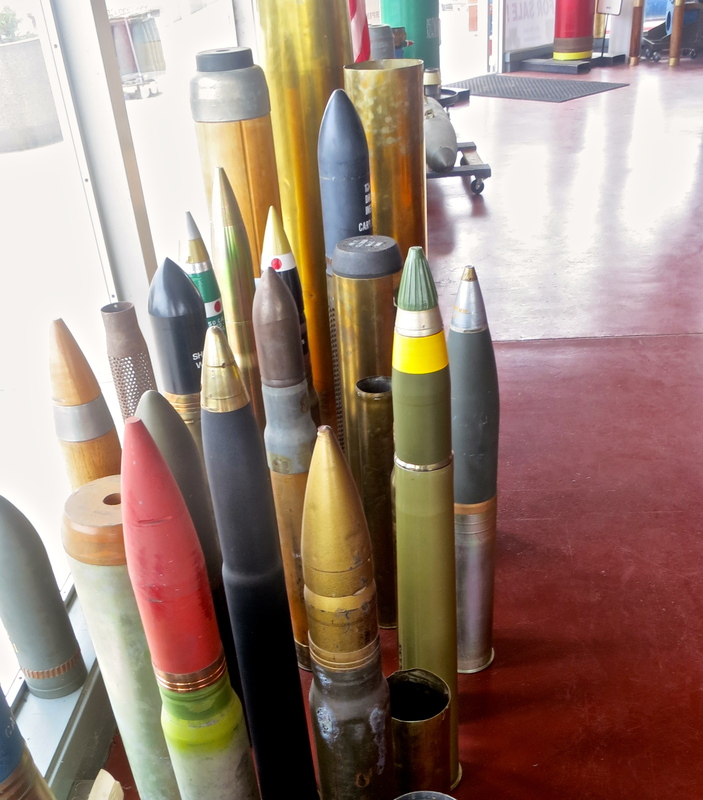 For one, the museum’s claim to fame is being“the Single Largest Museum Collection of Inert Ordnance, Missiles, Bombs, Rockets and Nuclear Weapons in the World.” For two, it has a great group of friendly and knowledgeable volunteers– more than prepared to talk your ears off. For three, the collection is somewhat eclectic. 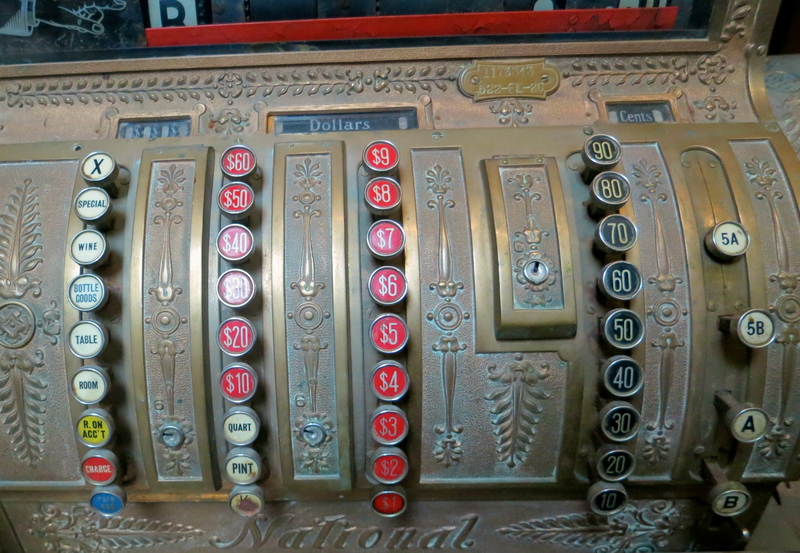 Like what was the old cash register doing there? A front view of the museum. Ordnance, such as this bunker buster in the foreground, is found outside as well as inside. This should take you back in time. Harold Warner was on duty when Peggy and I showed up an hour or so before closing time. 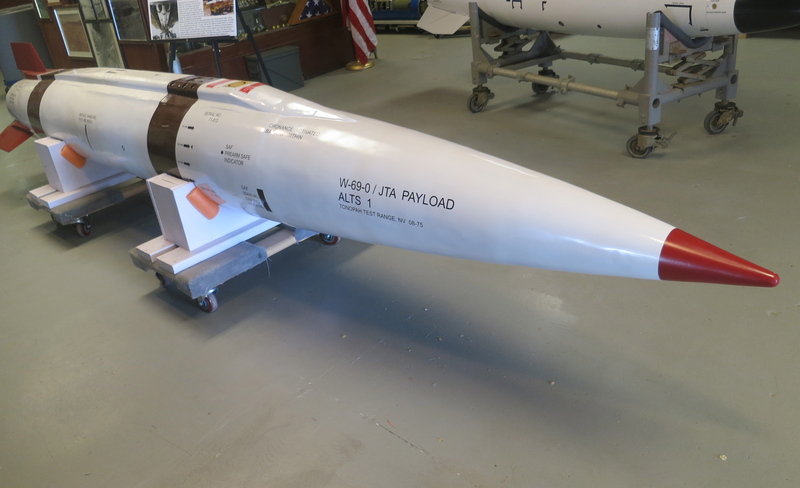 We had visited the museum before but Harold was quick to point out that there were some new kids on the block: nuclear missiles that he had gussied up with a paint job. He was quite proud and they looked, um, quite deadly. You did get the inert part, right. Harold was quite proud of the paint job on this inert nuclear missile. A couple of guys from California (looking very militia-like) were wandering around ogling the military hardware. They approached Harold about purchasing automatic weapons. He was quick to tell them that the museum’s collection wasn’t for sell but softened the blow somewhat by suggesting they could probably pick up whatever they wanted by visiting local garage sales. Harold told us that many of the troops going to Afghanistan did their training in Hawthorne. Considering the stark desert, it made sense. What fascinated me more, however, was that he also said that the locals from the town served as the insurgents for training purposes, sort of the B Team. No thanks, I thought to myself, picturing a platoon of marines chasing me across a nighttime desert as I dodged between bunkers filled with deteriorating bombs. I like a good adventure, but there are limits. Visit the Hawthorne Ordnance Museum website or check out it’s Facebook page for more information. Here are a few more photos. Any idea what this is? 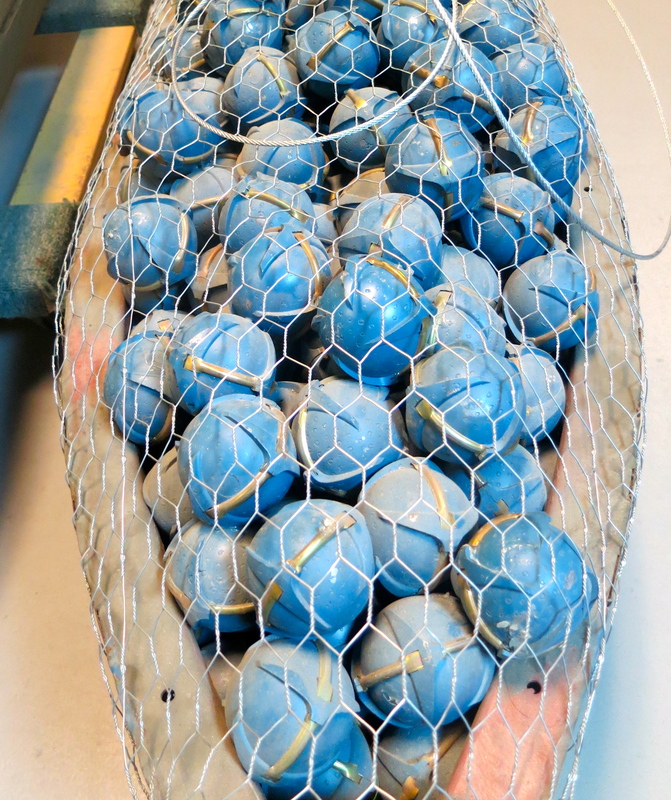 It’s a cluster bomb– lots of little bombs inside a big bomb. The probably contain enough shrapnel to take out a national forest. Going nose to nose with a machine gun. Note to children: Don’t try this at home. 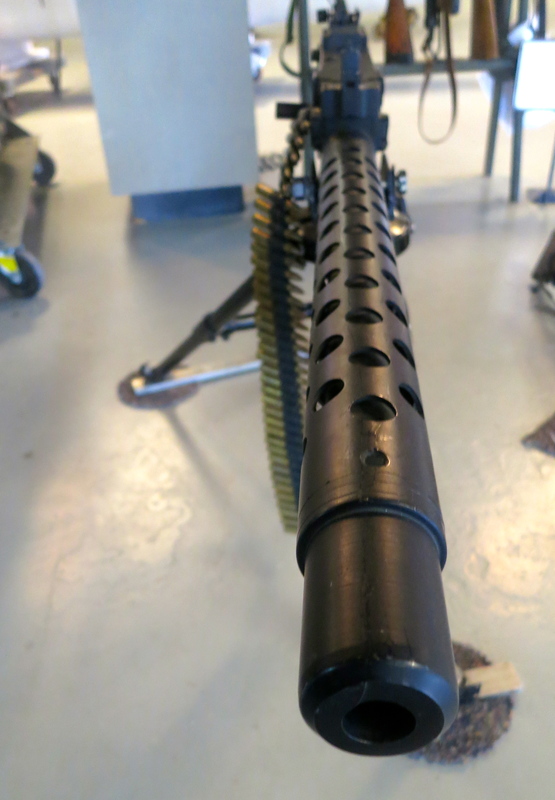 Checking out the machine gun from the other end. A final photo from the museum. NEXT BLOG: Drum Roll Please… Peggy and I disappear into the heart of the Nevada desert and Area 51 searching for ET. Mmm, though interesting I’m sure, I’d give this one a miss as any military kit gives me the heebie jeebies. Now ET, that’s a whole other matter! Give me a forest and river anytime. Those cluster bombs and painted bullets don’t look very friendly to me. Very interesting shot of Nevada but for the bunkers. Is hiding something so dangerous in Nevada like that called “hiding in plain sight”? How tall are the things (because I don’t know what to call them) in the last picture? You saw the Nevada testing at the time in the 50s? Glad you weren’t any closer. Just call me The Third Degree. And where does that phrase come from anyway? You know what’s truly the spookiest thing about this post? When the email notification arrived, I couldn’t figure out what seemed “wrong”. Suddenly, it came to me. That right-hand column, where gmail always sticks their targeted advertising? It was completely blank. Not a single ad. Just pure white space. I’ve never seen that before. Hmmmmmm…. This really is fascinating, and it begs the question: where in the world are they storing the current stuff? Given the news about the DoD Directive allowing use of military force against civilians and the stockpiling of weapons and ammunition for such departments as Forestry and Education — well, let’s just say I’m tending to scan the horizon a little more often than usual. Love the detail about the Hershey’s kisses — and that last photo looks rather like a bunch of sharpened Crayolas. War as child’s play? It’s a scary world out there, Linda. As you know. And I don’t think it is getting any less scary. The two guys looking for automatic weapons were real. And I suspect that Harold’s comment about being able to pick them up at local garage sales was also real. The “third Degree” is the third and final training of a Freemason. So… Why do they have train tracks running out to those silos, what the hell they storing out there??? Not sure about hitting the Like button. Fascinating stuff to look at, but it is depressing to the think how much human ingenuity, time, resources and cash has gone into trying kill other humans. And yes, I know that war tends also to be a spur to medical and manufacturing progress. Now this would be right up my Dad’s alley..He was an artillery man in the National Guard and I have many a photo of him playing with the “big” guns. It is such an oxymoron for he was such a peaceful soul..
Little story, when I was in the Army I had to fire an M2 Grenade launcher, as soon as I hit the trigger I fainted..Yes, keep me off the war front! LOL… I’l bet that went over well… he he. With your masterful writing, you made a topic I wouldn’t care so much for interesting. If I ever find myself in that neck of the woods, I just might visit since everything is inert. Talking about transitions, from putting foil on Hershey Chocolate Kisses to disposing of “unserviceable munitions,” hmmm. I have a story playing in my head, about how one wicked ‘ole scientist steals the secret formula for turning inert missiles active (a formula that was developed in case of a threat), and wants to sell it to the . . . (fill in the blanks). If I can write it quickly enough, it may just be a summer 2015 blockbuster 🙂 Or has a movie with a similar theme been made already? Hello Hawthorne Ordance Museum . . . I gotta visit this place! Do you think they’ll let me enjoy one of my stogies there? I believe the first machine gun was a .30 caliber and the second BIGGER one was a gatling gun, variations used in the Warthog (tank killer) and “PUFF”, the gunship. 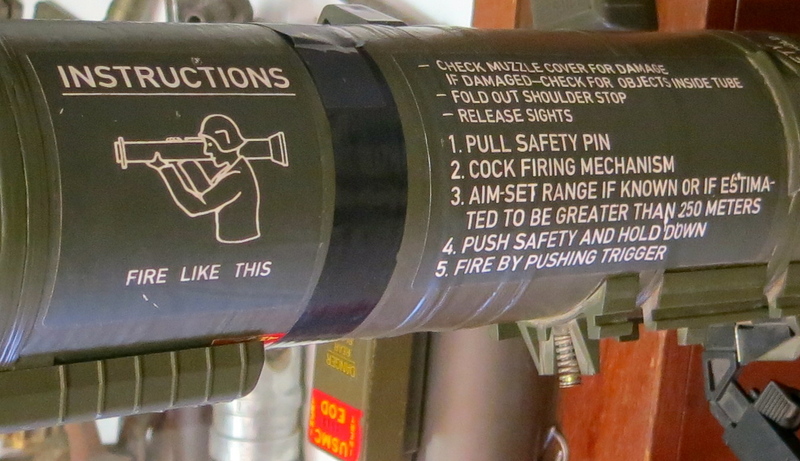 I hope those are mock up, fake UDT rounds in that gatling gun. 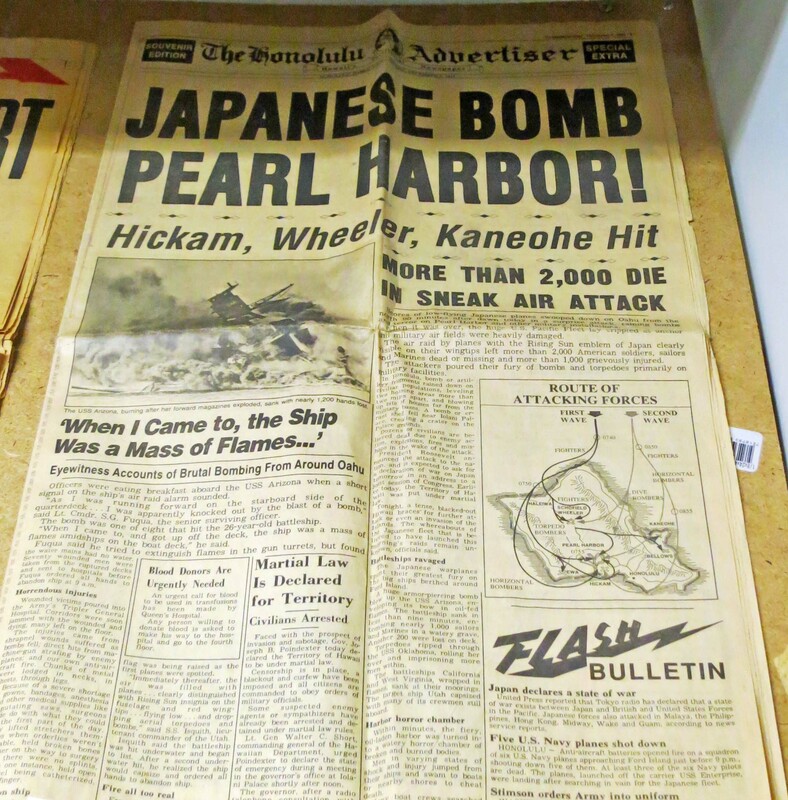 BTW, the Honolulu Advertiser was one of the newspapers who had as a headline one week BEFORE Pearl Harbor that the Japanese would be attacking “that weekend”. 🙂 You gotta wonder why they printed that. was going thru some boxes and found a news paper like the one you have,japanese bomb pearl harbor .is it valuable thanks. Tuolumne County, California , and adjacent counties, Western side of the Mountains… we hear the booms, each time Hawthorn Depot Explodes old Ordinances.. In fact lately, windows are shaking and the sounds has been very loud, fraying nerves !! !